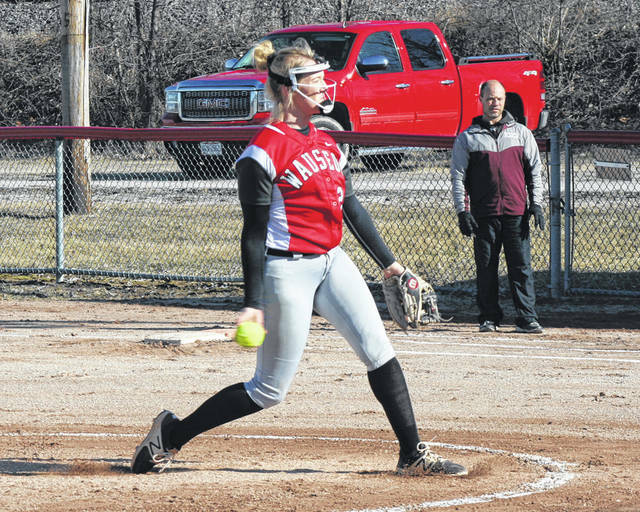 Wauseon pitcher Macee Schang deals during Tuesday’s home opener against Edgerton. She would pick up the win in the circle, punching out 10 Bulldog hitters along the way. Chelsie Raabe crosses the plate for one of Wauseon’s 13 runs during the win over Edgerton Tuesday. Juli Spadafore of Wauseon puts a ball in play during Tuesday’s game. 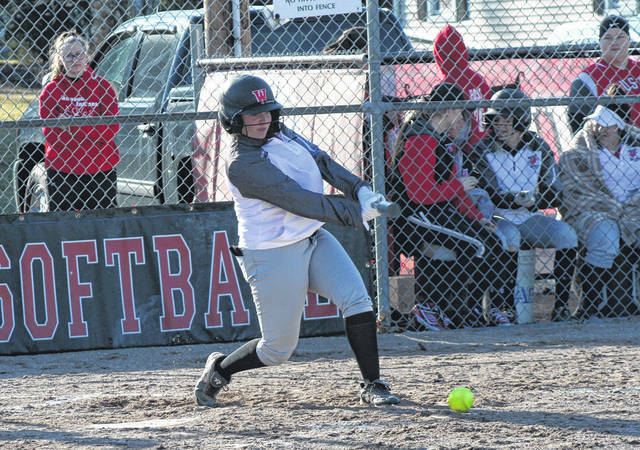 Two big innings was all Wauseon needed as they overcame a brief 1-0 deficit for a 13-1 five-inning win against Edgerton in non-league softball Tuesday. The Indians, who began the season on the road where they defeated Defiance 6-4 Saturday, are now 2-0 after the home victory over the Bulldogs. Edgerton took the early lead in the top of the first when Rylie Moreno drilled a home run over the fence in left field with two outs. However, the Indians would waste no time striking back. Payton Albright led off the bottom of the inning with a walk. Christina Norman also reached with a base on balls, then a single from Alisa Shelt scored Albright to knot the score. 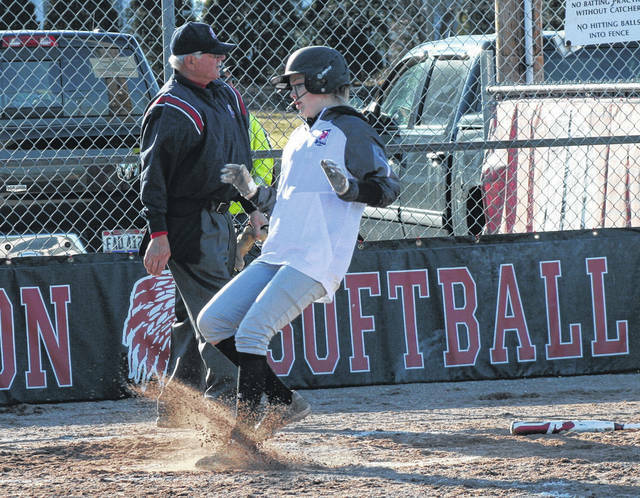 Norman, who had made her way to third, came home on an infield single from Harlee Floss to put Wauseon in front. The gap widened even more when Macee Schang smacked a homer to straight away center field, making the difference 5-1. Jettie Burget and Chelsie Raabe tacked on RBI singles for a seven-run frame. That margin remained until a six-run fourth for the home team. Raabe walked to begin the inning, then she scored from first when Albright’s single skipped past Edgerton’s center fielder. Norman, Floss, Schang, and Burget each added RBIs for the Indians, plus they tallied an unearned run. Both Schang and Burget’s hits were doubles. Schang did not mess around in the circle, striking out the side in the top of the fifth to end the game via the run rule. She earned the win, allowing just a run on two hits with 10 strikeouts. Schang also went 2 for 3 at the plate with four runs batted in. Albright (2 for 2) and Burget (2 for 3) added two RBIs apiece. Ashlynn Sleesman took the loss in the circle for Edgerton. Wauseon now hits the road again as they are at Napoleon Thursday and Rossford on Friday.